Moments before removing the two week old bald eagle nestling from its nest. The work week started with some early morning texts between biologists and CWF volunteers. Chances are, we weren’t discussing the normal topics that most co-workers were discussing on a Monday morning. We were discussing plans to prevent disaster and the life of this young bald eagle, all before the incoming inclement weather arrived later in the day… Its nest was built in a very old and rotten osprey nesting platform that the eagles took over. After close inspection last week (while installing a predator guard) we realized that the pole might not last the time needed for this nestling to fledge. So, we formulated a plan and coordinated help from some dedicated CWF volunteers to replace the platform and move the nestling from the old nest to the new one. Long story short, it was a success! On Monday we worked quickly to remove the nestling from the nest, then installed a new one next to it. We watched and waited for the adults to return and they did. We’re hopeful that the nestling survives to fledge. 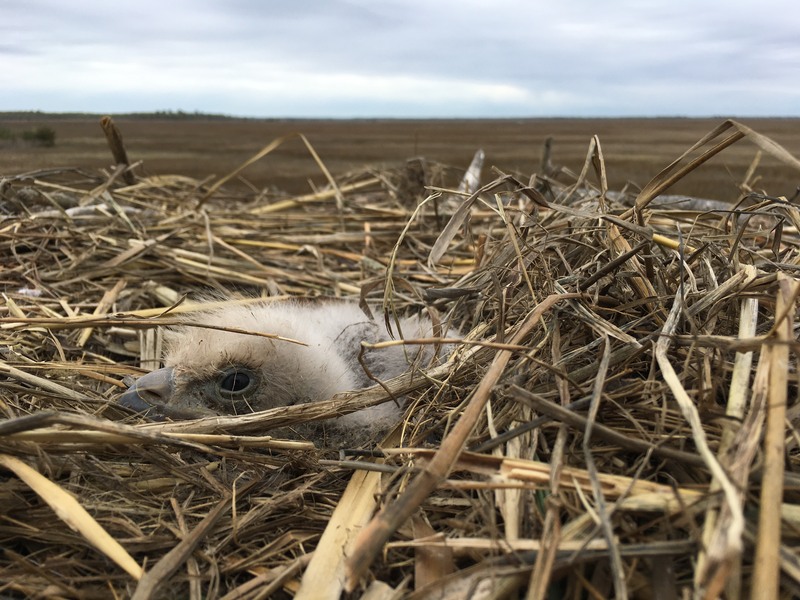 If it does, then we are planning to attach a satellite transmitter to it to help track its movements and use them to help protect eagle roosting habitat in New Jersey. Thank you to our volunteers for the help! This entry was posted on Tuesday, April 25th, 2017 at 4:52 pm	and is filed under Raptors. You can follow any responses to this entry through the RSS 2.0 feed. Both comments and pings are currently closed.